Well 2016 is coming to a close. This year has been a rollercoaster, it started off fairly quiet and grew into a roar. I was focused on my goals and achieved them which now frees me up for the next chapter in running and in life. 2017 is shaping up to be another year of growth, change and well... life. Let's run through some of the highlights! I kicked off the year at WDW running my 3rd Dopey Challenge and my 6th WDW Marathon. I LOVE this race weekend and the friends I get to see. A week from today I'll be in Florida again tackling my 4th Dopey Challenge - woo hoo! Then I muddled through the winter months (which lasted into April here) and with help from my coach Steve Stam I stayed focused on my big goal, the one I had been working toward for 2 years but been unsuccessful alone, qualifying for the Boston Marathon. I got to run an awesome half marathon in Denver, the Platte River Half, where I got to meet some BibRavePros from near and far! After lots of tempo runs, speed drills, long runs later, and running smarter I eked out a BQ at the Famous Idaho Potato Marathon setting a 9 min PR! We then went and camped in a crater (aka a lava flow) on our way home! Then came one of my favorite races, the Bolder Boulder! This race is just so fun and walk/running it with my boyfriend was a special treat. As we did the year before, after the race we circled back to watch the elites. They are incredible! I then buckled down for the summer and continued working with my coach to gain speed, endurance, and confidence as I narrowed in on another BQ attempt to shave off some more time. I had my eye set on the Sioux Falls Marathon and along the way to that start line I worked towards my goal of 28 half marathons before I turned 28. 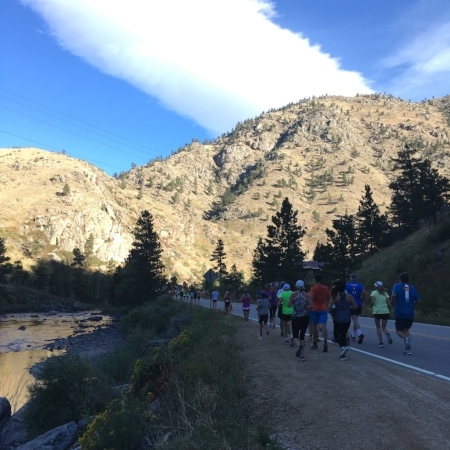 I ran the Human Race and the Vail Trail Half. Both were great experiences and full of really awesome runners! After Sioux Falls, I then enjoyed the downhill meandering canyon journey that was the Fall Equinox Half. It was beyond beautiful and while my legs were still very tired from the marathon the week before, it was a fun race! Now that all that running was done it was time for some real fun, off to Europe I went to run the Inaugural Disneyland Paris Half and have the experience of a lifetime in France and Germany. I had so much fun at this race and traveling I really never wanted it to end. Once I was back, it was time to find 2 more half marathons to meet my goal of 28 half marathons before I turned 28 on 11/22! I signed myself up for some Halloween fun at the Kooky Spooky Half which was a challenging course but a really well run event. I also always love an excuse to run in costume! And just as we rolled into November, I ran my 28th half marathon on the trails of Highlands Ranch, CO at the Backcountry Half Marathon. It was a beautiful race and I just enjoyed the experience and reflected on all that I had accomplished in 2016. The rest of 2016 has been a mixture of trying to take a break mentally while staying focused on getting my miles in for the Dopey Challenge where I'll get to see friends and bask in the magic of the weekend. I'm closing out the year with over 1600 miles to my name and a dose of confidence and strength that's been earned through hard work. Only 1 more week and I'll be kicking of 2017 with a bang again at WDW! I ran everywhere from trails to Disney parks and had a blast! I'm stoked for another year of running and I hope you are too! What was your proudest accomplishment in 2016? What are you looking forward to in 2017? Leave me a comment!